We are trying to cut on desserts but it so difficult because I love to bake! Even on week day Hoa also talked about how nice it is if we could eat something sweet after dinner. So even when I did not plan to bake anything, the temptation of eating something sweet is overwhelming so of course I give in and bake. 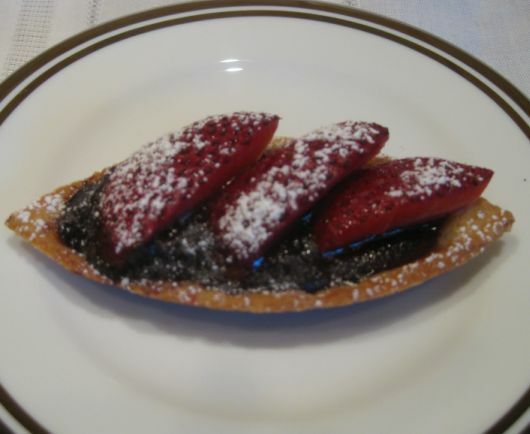 I have lots of fresh fruits but I rather have a real dessert and then I remembered having some extra some pâte sucrèe left over in the fridge so I decided to bake a few tartlets filled with chocolate ganache topped with some ripe strawberries and then dusted with powered sugar. My pâte sucrèe recipe is actually is pretty good! The crust stay crunchy for days. Close look at the tartlets. 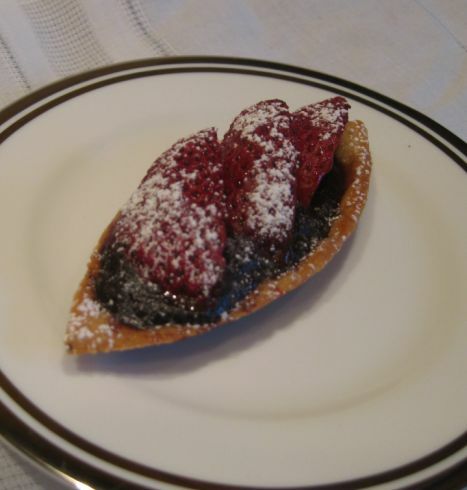 We only ate one tartlet each and the leftover tarts can be refrigerated for a few days and it would not alter their taste.